Pop culture movies, music, and television shows often depict girls—as early as during elementary school—as being viciously cruel and judgmental to their classmates. The “mean girl” archetype has evolved for a reason. According to National Voices for Equality, Education, and Enlightenment (NVEEE), more girls (59 percent) are cyberbullies than boys. The National Education Association (NEA) also reports that girls are more likely to be victims of relational bullying—a less overt but more emotionally damaging form of bullying defined by gossiping, group exclusion, and rumor spreading—at the hands of other girls. 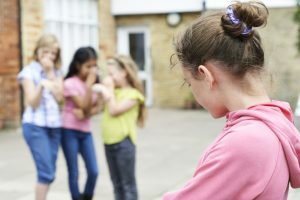 Despite the number of young women who are bullied every day, it can be difficult for adults to identify this dangerous behavior, as it is not always as overt as pushing and shoving on the playground. Familiarize yourself with the signs of emotional bullying so you can help protect your students. Familiarize yourself with your school’s bullying policy. Ensure you are reinforcing the school’s code of conduct in your classroom by implementing the appropriate disciplinary actions as outlined in your school’s policies. Send a copy of your school’s bullying policy home. Parents should be part of the solution to end bullying in our schools. Make sure all parents know that you maintain a zero tolerance policy for any form of bullying in your classroom. Observe student behavior. Whether you are in your classroom, supervising lunch in the cafeteria, or chaperoning a field trip, make sure you are watching the behaviors, body language, and actions of your students. In these moments of observation, you may learn all you need to know about who is being a bully and who is being bullied. Address bullying immediately. If you observe what appears to be an act of harassment, intimidation, or exclusion, address it with both parties on the spot. Not doing so will only enable future hurtful behavior by the bully. Report bullies to your principal. He or she can address the student’s behavior at a higher level and involve parents in necessary disciplinary actions. Be available. Tell your students that you have an open door policy in which to discuss anything that is bothering them. During their critical developmental years, young girls are easily influenced by the opinions of others. By maintaining a zero bullying policy and intervening when social behaviors reach dangerous levels, you can help make a difference in the lives of your students and can help turn potential victims into confident young ladies. For more information on how you can help stop bullying at your school, check out these resources from StopBullying.gov.